A euphemism that has nothing to do with actual torture, but refers to Chris Carter's propensity for damaging Mulder in various ways that allowed Scully to comfort him. H/C, MT, SC. New contest coming soon. AS TIME GOES BYE THEME: Still taking submissions "" . Click on the pic to take you to the stories. Check out our contest page for all the details and rules. Click here for the longer stories. New challenge for this coming very soon. I know of at least a few in the pipeline. Some ideas that have come back around again include "Dinner and an X File", with apologies to TBS's "Dinner and a Movie". Recipes to tempt the palate with ingredients and names that tie into favorite episodes. 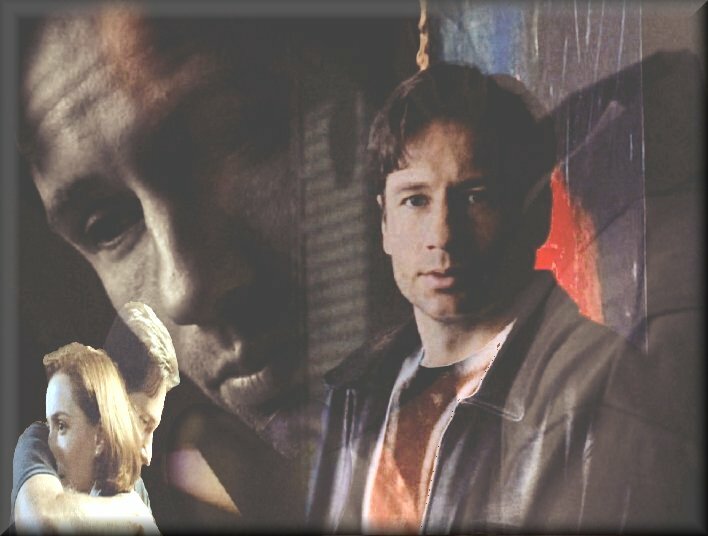 New create a caption pics for the MulderTorture pic of the week. We're a pretty creative bunch, so this promises to be entertaining. You're invited to join in! Your suggestions are welcome, too! Just click on the "contact us" link at the top of the page. Collages! Submit your own or just browse ours. We are always looking for more. Art and Collage challenge soon. X files belongs to CC and FOX (C)For entertainment only. No profit. No Infringement intended.